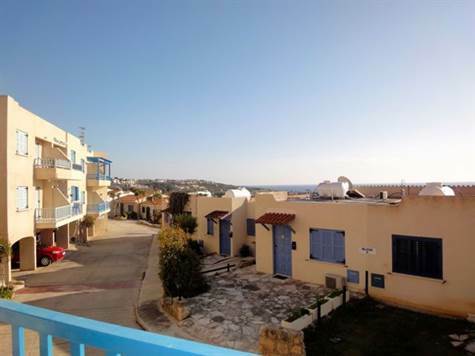 Chloraka Village, Paphos - This one bedroom apartment is located in the popular village of Chloraka near to the main coast road. Local shops and restaurants, the beach and local bus stop are all within easy walking distance. The property features an open plan L-shaped living room with corner kitchen, a double size bedroom and family bathroom. Patio doors in the lounge open onto a covered balcony with sea views. The communal swimming pool is a short walk away, and there is plenty of parking spaces available near to the apartment. The property is furnished and has full title deeds.